Sorry to say it, but I've been sick as a dog lately. I know I mentioned it in my last post but it honestly only went downhill since then. I've only been able to sleep through the night for the first time last night since about a week and a half ago. I got a nasty fever and cough that I'd been fighting for a while but then I got a stomach virus on top of that which is all sorts of NO FUN. I've missed so much work, and the worst thing is being sick at home alone! But at least my hubby comes home in the evening and my parents live close by. Don't know what I'd do without them. Since I've had the need to limit my computer time (and tv and any screens that zap away precious energy), I did find time yesterday to do my nails. I apologize for the wrinkly hands, but all that frequent handwashing is just not doing them so well lately. For the insane amount of Gatorade and herbal tea I've been drinking it astounds me how dry my skin has been. Anyway, it's nothing too complicated. Just a basic french with a stripe of silver glitter under the white, rainbow glitter on the upper half of each nail, jewels on the ring fingers, and a clear topcoat. When I pop in next I will be checking comments, so please give me your best remedies for sickness recovery and also maybe some nail looks I should try. I saw some wicked ones on that soompi nail thread that are amazing. 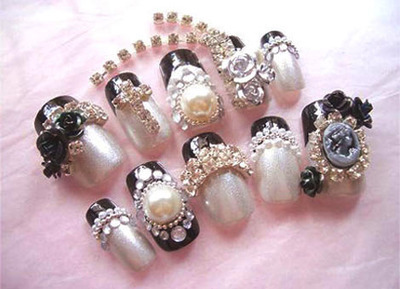 I wish I could get those crazy Japanese 3D gel nails with all the bows and embellishments on them! Who's with me?! Wow, I've always been envious of Japanese nail art too! How do they fit in all those gorgeous details? Well, maybe it doesn't actually help with the cold, but it feels so much better! Aww, I hope you feel better soon. Soup and crackers, honey tea and a hot water bottle always make me feel better. 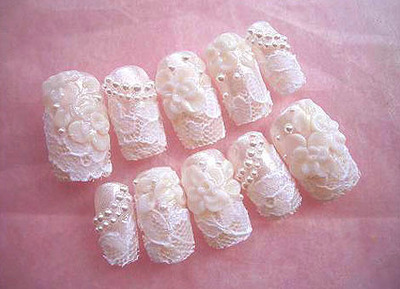 i lovee the japanese nails....but i'd be too scared to wear acrylics like those cuz im so scared of damaging my nails. Also, i always wonder..how do they type and stuff with nails that long. Have you been getting lots of rest? I am so with you on Japanese nails! also, you should really try to drink chicken noodle soup.. I have no idea how it really helps you but people say that it helps nourish you AND you drinking lots of liquid too. I'm sorry to see you sick, especially with a stomach virus hahas but you've met an expert, I get stomch viruses at least twice a year, it's horrible, but the remedy is to 'flush' your system. The last time I had a stomach virus I was hospitalised and they made me drink 1.5 litres of water every hour. I was issued probably nine in the morning and I got dismissed by dinner time. Congee is always really good if your sick but my parents refrain from giving me anything chicken because something about chicken making fevers worse...? It's an old myth. oh my goodness :) your nails look amazing !!! 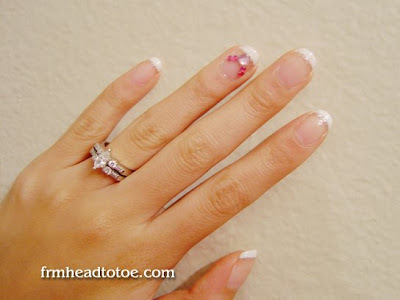 i really should try that soon cause my nail shape looks exactly like yours !! do you use the "tape guides" for your nails? Warm water and vitamin C help a lot. I love to read your beauty tips. Get well soon! Today while I was surfing the Internet, I came across several interesting articles talking about UV nail lamps and how to use them with gel nail application. I also happened to visit this site Gel-Nails and found amazing variety of UV lamps in American and European style. Some of these lamps also have a timer and a digital display which I think is really cool. And what’s best above all is the super discount that you can get which is 50% and more also for most of the products. I guess this is a great offer to grab as there is free global shipping also over a minimum purchase order. So if you are looking out to save money after having spent on gel nails, then check out the great offers here. Maybe you may find much more than what you are looking for as I did.